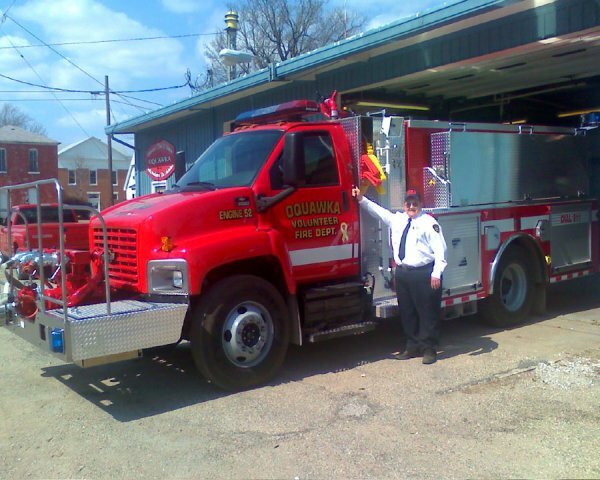 Oquawka: Hal Jern, the Fire Chief of the Oquawka's Fire & Rescue Department, was selected this month as the Oquawka's Citizen Of The Year by the Oquawka's Village Board. According to Oquawka's Mayor Vernie Alecock, the board selected Jern from three individuals that were being considered for the annual honor. "Hal has done a lot of good for our community and he has done a great job on the Fire Department." Alecock said that Hal works hard on organizing parades and on the 4th of July events to make it successful. Jern not only sparks community spirit on the 4th of July, but according to Alecock, "He'sÊvery conscientious about everything he does and he goes all out for it. Each year Oquawka Citizens send in names of residents who they would like to see honored for their contributions. The board sorts through them and chooses one who they believe is the most deserving of the honor. "Hal was the one everyone wanted," said Mayor Alecock. The Mayor's wife Beverly, said, "HalÊis a very good citizen and he is always willing to help." The Alecocks mentioned how much Hal enjoys the kids that come to visit at the Fire Station and how whenever the school needs anything, such as for Fire Week, Jern brings the trucks and some firemen and gives a program to promote fire safety. "Hal is an all-around good guy and he always puts his heart into whatever he does," Beverly said. "He's well thought of around the community."